Thomas De La Warr, the son of Thomas West, the 11th Baron De La Warr, was born in England on 9th July, 1577. Warr and 150 settlers arrived in Jamestown on 10th June, 1610. He was appointed governor of Virginia and organised the of two forts near the mouth of James River. 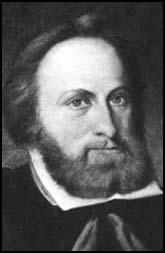 After reorganizing Jamestown he appointed Samuel Argall as his deputy and returned to England. In 1611 De La Warr published Relation, an account of the Virginia settlement. When news reached De La Warr about Argall's tyrannical rule in Virginia he decided to return to America. Thomas De La Warr died at sea on 7th June, 1618. Delaware Bay, the Delaware River and the state of Delaware have all been named after De La Warr.